The occasion of the publication of Timothy Geithner’s book “Stress Test,” giving his version of the financial crisis, has led to a number of newspaper articles looking back at the Great Recession and its aftermath. The New York Times’ economics reporter David Leonhardt has such an analysis “A Rescue That Worked, But Left a Troubled Economy” in today’s NYT. In my opinion, the real problem is not our financial system but the strong headwinds which are slowing down the economy. Globalization of markets which creates huge pressure for low operating costs. Labor saving technology which also puts downward pressure on wages. Women and immigrants having entered the labor market in huge numbers, and therefore greatly increasing the labor supply. The loss of wealth in the Great Recession also means that even people with good jobs have less money to spend. 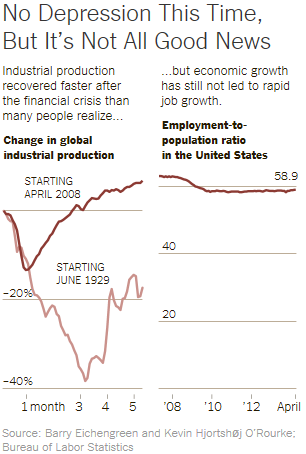 What we sorely need is faster economic growth to create more jobs and higher paying jobs. How do we accomplish this? The best way to boost the economy is with broad-based tax reform to achieve the lowest possible tax rates to put more money in the hands of the working people who are the most likely to spend it. Such lower rates can be offset by closing the myriad tax loopholes and at least shrinking, if not completely eliminating, tax deductions which primarily benefit the wealthy. Lowering corporate tax rates, again offset by eliminating deductions, providing a huge incentive for American multinational companies to bring their profits back home for reinvestment or redistribution. With millions of unemployed and underemployed workers, reviving our economy with a faster rate of growth should be one of the very top priorities of Congress and the President. Survey after survey show that this is what voters want. Why isn’t it happening? This entry was posted in David Leonhardt, economic growth, economic mobility, economic opportunity, Economy, financial crisis, globalization, Great Recession, immigration, Jack Heidel, New York Times, pro-growth economic policy, pro-growth tax reform, tax policy, tax reform, The Snail Economy, underemployment, unemployment, wealth tax, women in the labor force, women in the workforce and tagged corporate tax reform, economic growth, Great Recession, jack heidel, New York Times, tax reform, wealth tax by jackheidel. Bookmark the permalink. Jack, have to assume your question: “Why isn’t it happening,” is intended to be rhetoric. Given the performance of Congress as well as the executive branch, I wouldn’t hold my breath for anything in the way of economic legislation that might fly in the face of “progressive” orthodoxy until after Senator Harry Reid is retired as majority leader in the Senate. Yes, the question is rhetorical. I’m trying to focus, on this blog, on what I think would be good policy. There are all sorts of roadblocks to implementing good policy. And even when something can be done, it’s going to end up being a compromise between differing points of view. As an outsider, I make no attempt to foresee how a good idea might actually get implemented!